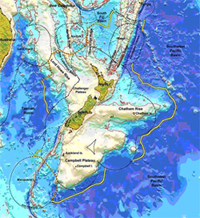 The New Zealand Continental Shelf Project is a seven-year $44 million Government funded programme to collect data for New Zealand's submission to the Continental Shelf Commission on the Limits of the Continental Shelf (CLCS). Click the image at right for maps of the continental shelf, or read more information about the project below. Background to the treaty between New Zealand and Australia on the EEZ and Continental Shelf boundaries. View a computer-simulated flyover of the New Zealand Continental Shelf. Read the full recommendations released by the United Nations on New Zealand's successful submission. Find out about the project, including how the information for New Zealand's submission was collated and LINZ's role. This page provides background information on the treaty between New Zealand and Australia on the EEZ and Continental Shelf Boundaries. The following computer-simulated flyover of the New Zealand Continental Shelf has been created by GNS Science for LINZ. Following New Zealand’s successful submission to extend the outer limits of our continental shelf, the United Nations Commission on the Limits of the Continental Shelf released its recommendations on the submission. LINZ commissioned the initial desktop study to collate and examine all relevant data and identify areas where data was lacking relating to New Zealand's Continental Shelf. This map shows the boundaries for New Zealand's extended continental shelf confirmed by the United Nations Commission on the Limits of the Continental Shelf.